So you´ve done your research for your home cinema or lounge. You´ve worked out what you need and decided on your surround sound speakers and whether to go for a simple 5.1 or a fully immersive Dolby Atmos set up. You´ve placed your speakers perfectly and finally you´re ready to fire up your favourite film but the result is disappointing. With a lack of bass, the depth of sound is not what you imagined. Voices are hardly audible and that feeling of being right in the middle of the action? Well it´s just not there. The first thing to point out is that every room is different and there is no perfect set up. All speakers, no matter the power, quality or brand will never sound amazing if you haven´t got your room acoustics right. Room shape, ceiling height and wall and flooring material can all have an affect on the acoustics. While you may not be able or want to completely redesign your room, there are some things you can do to improve the sound quality. Generally ´hard´ surfaces can cause echoes and harsh sounding acoustics and ´soft´ surfaces can create a dull and lifeless sound. A room full of hard surfaces like tiles, glass and concrete will lead to a lot of sound reflection. On the other hand lots of soft furnishings such as fitted carpets and floor to ceiling curtains could potentially create an acoustically dull room. Both resulting in poor sound quality. Ideally you will want a mixture of the two types of surfaces for the best result. Try to avoid having very large areas of bare walls and floors but keep it balanced. Carpeting or a rug is a good idea between the front speakers and listening position. Also consider wall paneling or curtains at the front but not covering the entire wall. The idea is to allow as much sound as possible to travel directly from the speaker to the listening position. 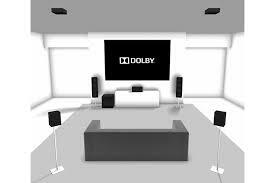 With these considerations plus some fine tuning in speaker placement you´ll be well on your way to amazing cinema quality surround sound. 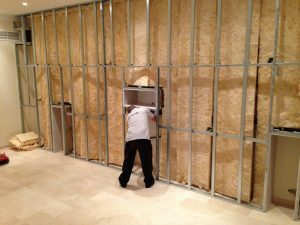 If you´d like more information or if you need advice on how to start creating your home cinema room or lounge contact us today. This entry was posted in Home Cinema by TV ONE. Bookmark the permalink.